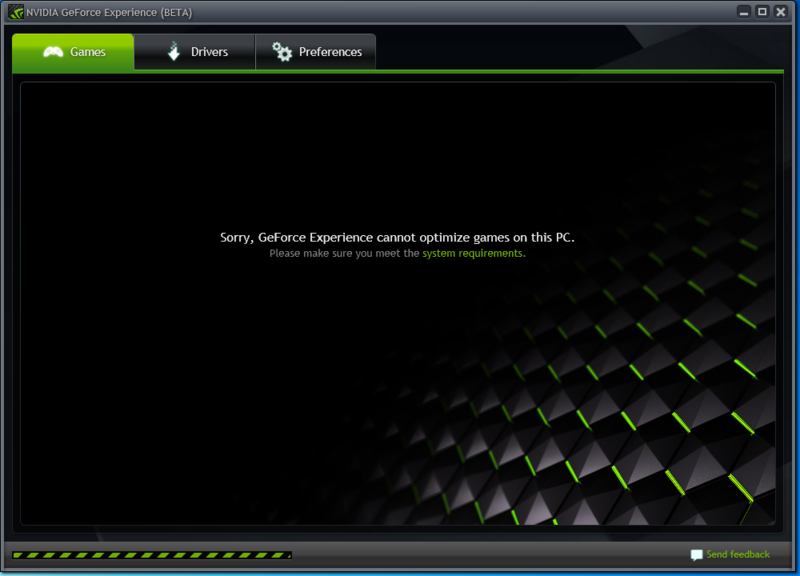 NVIDIA Home > Support Home Page > Knowledgebase Home Page > GeForce Experience says my hardware isn't supported. GeForce Experience says my hardware isn't supported. For optimal playable settings, GeForce Experience requires a Fermi or Kepler-based GeForce 400, 500, 600 Series or higher (desktop and notebook) GPU. A Intel Core i3/i5/i7 or AMD Phenom II/Athlon II/Phenom X4 or higher CPUs is required. Core 2 Duo or Quad based CPUs are currently not supported. For more details please see the system requirements. Does GeForce Experience support NVIDIA Surround?